(CNN) -- After 40 years of appearing on the silver screen, actor Amitabh Bachchan is the elder statesman of Indian cinema and is possibly the most recognized man in India. The Big B: The patriarch of Indian cinema has appeared in over 180 films. 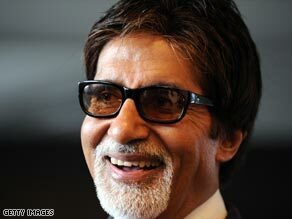 Born to a famous Indian poet, Bachchan made his screen debut at the age of 27 and has gone on to star in over 180 films. As such an established star he has seen Indian film making change over the years, weathered changing audience tastes and the evolution of Bollywood cinema. "I'm actually very happy with our content. Even though we were ridiculed, and the West were very cynical about the way we made our films and the content that it contained," he told CNN. "But that very aspect has now become its USP (unique selling point) almost, and people love to see that. I would not want to change that. I would expect that this is how and what our cinema is all about." If Indian films have gained a new found international interest, the way that Indian films are produced has also changed. From the industry's alleged connection to organized crime to better production quality, Bachchan has worked within the system and at the sharp end of making movies. "We have our own modes of working and how does one actually decipher that the person that you're working with has some kind of an underground link? You know, 'I am mafia' doesn't come written on somebody's forehead. "Whether he, you know, collects his money from wherever it is ... is really not our concern. We are interested the story, the concept, in our roles, the director who's going to be making it, in the creative aspect. That's it, " he said. The role that propelled him to superstardom was of a working class hero standing up to oppression and injustice in the 1975 film "Sholay". "During the 1970s there was a feeling of great dissatisfaction in the youth that the establishment of the system is not doing enough to take care of their issues and problems. When one individual stood out and challenged the system and came out victorious he suddenly became a hero," he told CNN. "I fortunately happened to be the actor that they chose to represent that kind of philosophy or thinking. And therefore I became a beneficiary." From being the "angry young man" of cinema in India he is now more commonly known as "The Big B" to the media and his millions of fans. But being such a public figure has never been a problem; Bachchan writes a daily blog and believes that it's in an actor's make-up to thrive in public attention and that stars should be able to deal with praise as well as criticism. "I think we all live to be recognized ... creativity would be useless if no one ever saw it or recognized it. We want our work to be known. "I enjoy my blog greatly because I invite comment. Not all of them are complimentary, many of them are abusive, but I never moderate it because I think it's important to know what the rest of the world actually thinks about you." Taking the good with the bad, Bachchan was recently criticized for reportedly being less than impressed by Danny Boyle's Oscar-winning film, "Slumdog Millionaire." But says Bachchan the unnecessary controversy was because of comments from readers on his blog had been mistakenly attributed to him. "I was wrongly accused. I did get to see the film. I thought it was a very well made film, great story," he told CNN. If "Slumdog Millionaire" illustrates current interest in Indian films by the West, Indian movies have also developed in ways more familiar to Hollywood movies. "Life has become a lot faster. We've had to move with the times and adjust. If you were to analyze an indie film of the 1970s ... there would be far, far less editing cuts of, say, a film that was released in 2009. That philosophy [from TV editing], for some peculiar reason, has now translated into the minds of the audiences and they expect the same kind of treatment when they go out to see a movie," he told CNN.